Aufsturz is a small and pleasant restaurant and bar that hosts concerts in their basement club. 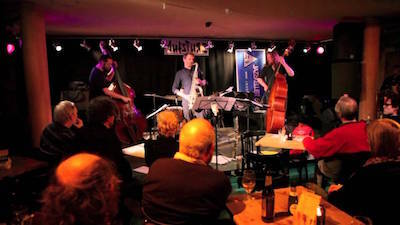 While their concerts range from pop and rock to swing, they also host concerts organized by the jazz collective "Jazzkeller 69" since their original location closed down in 2002. Compared to your average jazz club, the concerts organized by the Jazzkeller69 tend to be more experimental or avantgarde. For the full programme please visit the Jazzkeller 69 @ Aufsturz website. There is a monthly jam session at Jazzkeller 69 @ Aufsturz on every first Tuesday at 20:00.